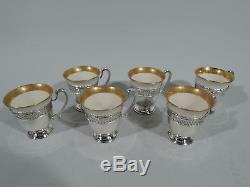 Set of 6 sterling silver demitasse holders with porcelain liners. 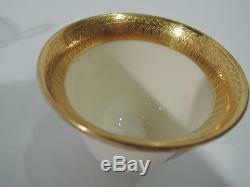 Each holder: Bowl has pierced interlaced scrollwork between gadrooned borders. 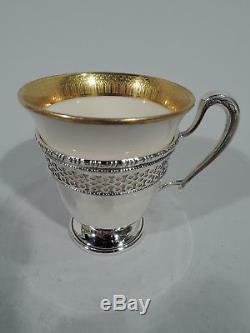 Interior has gilt band with raised imbricated leaves and egg-and-dart border. 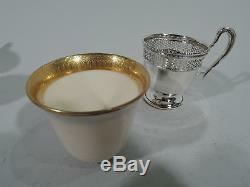 Holders hallmarked with Frank M. Liners marked Lenox and numbered J40. Overall dimensions: H 2 3/4 x W 3 1/8 x D 2 3/8 in. 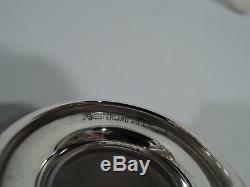 Total weight (silver only): 6 troy ounces. 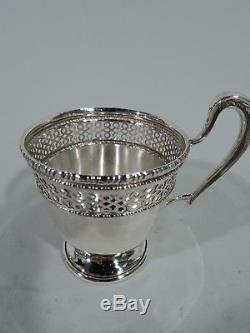 The item "Frank M Whiting Demitasse Cup Holders & Lenox Liners Sterling Silver Porcelain" is in sale since Friday, September 14, 2018.